Our company offers a wide range of Carton Erectors that are used in various applications. Numerous top clients choose our Carton Erectors for the quality we provide. Our Carton Erectors are manufactured in competitive prices. We serve our client’s by understanding their requirements and with our ample experience in the field. We are looking for customers from South India like Andhra Pradesh, Tamil Nadu, Kerela, Karnataka etc. Durapak Carton Erectors / Case Packer are widely chosen by many customers for being best in quality and giving excellent performance during usage. 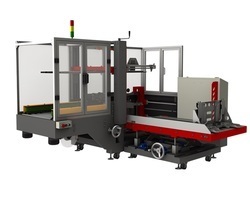 Recognized for their dependability and longevity, these Carton Erectors / Case Packing Machines are cost-effective solution in making carton erecting consistent, efficient and expediters. For keeping up with our commitment to innovation, applications not fulfilled by our standard line of erectors can be customized by our research and development team according to customers’ ordered specifications. Looking for Carton Erectors ?